The Peter Cushing Doctor Who movies of the 60's are unfairly maligned by fans. Despite being colourful adventures for the big screen, they are derided for being 'uncanonical' as Cushing plays a human scientist called 'Doctor Who' in adventures that are remakes of classic serials. Cushing himself had a theory that his Doctor was a future incarnation who had been trapped by the evil Celestial Toymaker into reliving past adventures (no, really, that was his idea, what a fanboy!) but to date the Doctor has not yet regenerated into Cushing, and he would surely not want to associate himself with such a racist caracature as th Toymaker. The Cushing Doctor's origins lie not in the future but in the past. For you see, it was he not Hartnell who was the real First Doctor, and so reveals the Doctor's name to literally be 'Doctor Who'. There's a lot of evidence in the classic series to suggest the Doctor's name is actually 'Doctor Who'. The Second Doctor signs his name as 'Dr W' and one time calls himself 'Doctor von Wer', German for 'Doctor Who'. He has no reason to lie about his name at such a time. The Third Doctor story 'Doctor Who and the Silurians' gives the main character's name away in the title. Why else would the Doctor drive the 'Whomobile' and have vanity number-plates of 'WHO 1' and 'WHO 7'? And of course there is the supercomputer WOTAN in the First Doctor story 'The War Machines' who constantly refers to the Doctor as 'Doctor Who'. As a genius supercomputer, WOTAN is incapable of error and so must be correct. If the Doctor's name was really Doctor Who, it makes sense that he would use it less and less over time as he instead uses the name he chose, 'The Doctor'. Perhaps self-consciousness played a part in this, or the desire to forge his own identity, not the one chosen for him by his parents. So Cushing's 'Doctor Who' could very well be our 'Doctor Who' by proof of name alone. But how could he be the First Doctor if William Hartnell was the First Doctor? Quite simply, William Hartnell did not play the First Doctor. He played the Tenth Doctor. In the classic Tom Baker story 'The Brain of Morbius', the Doctor battles Morbius in a Time Lord 'mindbending' contest. The goal of this contest is to force the opponent to mentally regress through their regenerations. Throughout the bout Morbius is winning, pushing the Doctor back and back. We see him go backwards from Fourth to Third to Second to First... and beyond! In total there are shown to be eight 'prior' Doctors to Hartnell. Some have later claimed these to be Morbius's incarnations, but the dialogue in the scene, the actions of the Doctor and Morbius, and the fact that the Doctor actually loses the contest shows them to be the Doctor. This was even confirmed by the producer Philip Hinchcliffe (himself one of the faces of the prior Doctors). So the Doctor's real name is Doctor Who and there were previous Doctors to the First Doctor. 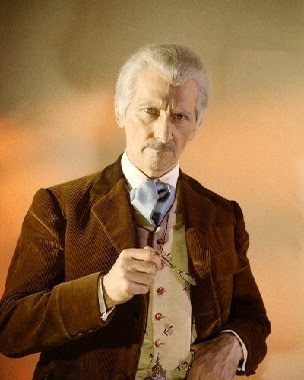 Cushing's Doctor was a human professor though, how could he be a Time Lord? The novels answer this question. In the New Adventures we learn far more more about Time Lord society. Time travel was developed by three founders of the Time Lords - Rassilon, Omega and The Other. The Other was said to be a mysterious figure even to Rassilon, who was instrumental in developing time travel, TARDISes and regeneration. Lungbarrow reveals him to be an earlier Doctor. The novel of Human Nature has the amnesiac Doctor writing a story about an old human scientist who invents time travel and travels to the world of Gallifrey to teach them about the secrets of the universe. Could this scientist have been Cushing's Doctor Who? If Cushing's Doctor was the real First Doctor, this would match perfectly. A human scientist who invents time travel, and travels to Gallifrey where he is instrumental in developing Time Lord society. It explains why his granddaughter Susan was adamant she had invented the name 'TARDIS' - she had! Cushing's Doctor being canonical actually answers more questions than it raises! Some may criticise this theory and wonder why the Hartnell Doctor didn't notice that the events of The Daleks and The Dalek Invasion of Earth were identical to previous adventures he'd already had. It can be surmised that as a time traveller who has lived a long life, many adventures would appear to be similar - after all the Third Doctor never complains that the events of Planet of the Daleks are identical to The Daleks. If he didn't mention it that time, why the time before? Fans can now watch the Cushing movies, secure in the knowledge that they are no longer wasting their time on fictional exploits, and that they are as real as the television show!